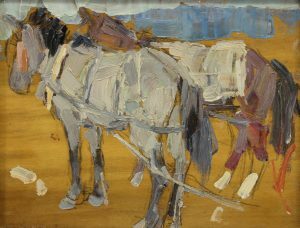 Leon Gaspard was born near Moscow, Russia in 1882 to parents that encouraged his artistic talents and supported his move to Paris to study at the Academie Julian. Gaspard was enthralled by the creative climate that surrounded him there. For several years he studied and showed his works at the Paris Salon. Following a two-year recovery from an airplane accident, Gaspard moved to New York in 1916 where he would live and exhibit for only 2 years before settling in Taos, New Mexico. In Taos, Gaspard was fascinated by the indigenous culture and set about studying and painting it. His vibrant style was rooted in Impressionism and he resisted many Moderist trends.